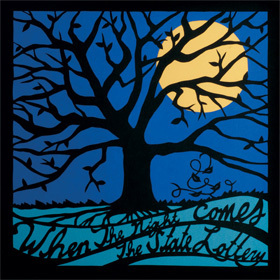 Here comes a raucous rambling record from The State Lottery, which is a group comprised of friends from various bands and various locations around the country. Members of Get Bent, The Gibbons, Thousandaires and Traffic & Weather all managed to come together from their various corners of the country to write and record When the Night Comes which combines 50's rock and roll with good time party nights and a punk break-the-chain ethos. Horns and cymbal crashes run amok as piano keys pluck in front of walking bass lines and upbeat guitars; there is a communal sense of adventure on hyperactive display in this recording. "Coming Alive" kick starts the heart of the album showcasing the brass balls and upbeat tempos that will play throughout the disk. Guitars become the focal point as the energy grabs a mosh-pit fever on the pumping "Stories" while ooh's and aah's dominate the title track. The album continues in these veins until the climatic closer, "Spring, 2008, Detroit" which scratches and claws with a drunken choir and screeching guitars. The obvious influence here is early Bruce Springsteen and the E-Street Band, we are talking way back in their Dr. Zoom and The Sonic Boom days, as The State Lottery perform with a looseness in their grandiose; a ramshackle approach to big band garage rock. That description might be a touch oxymoronic, but that is what you get here; lo-fi, big band and it is an intoxicating mix of urgent American soul music with a punk twist. A tale like "East Jordan" combines the holy with the gutter and makes you want to jump right in the communion bowl and bath with the wine as the trumpets blare towards the heavens. Big choruses complete with "ah's" and "yeah's" combined with urgent, shouted, lyrics add to the punk flavoring as does the bourbon soaked vocals. A bit of a minus is the production as vocals tend to get lost at times and instruments all bleed into each other, but while the lo-fi takes away from the clarity it adds to the all-in dynamic of the album. There is passion infused into these tracks, this group of friends are onto something and after listening to the album you will feel like you are on it too. Then go grab When The Night Comes for FREE right here...actually give the group a donation they could use it, or better yet order up the LP. This is a great listen, so support The State Lottery and enjoy.